This image shows you the position, related to Madrid downtown of San Lorenzo de El Escorial. 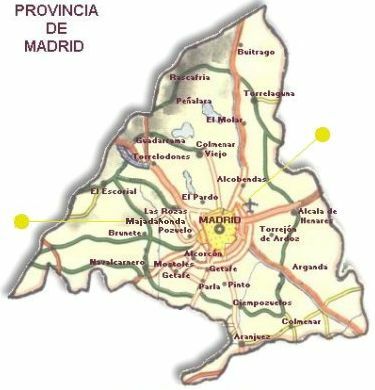 If you want to situate in the environment of the Madrid-Barajas airport, look this map of Madrid region. If you arrived into the airport, our suggestion is that you use the bus number 89, available at most of the terminals, that will drive you to COLON/RECOLETOS. The bus takes about 40 minutes, depending on traffic congestion. You can check this information, and time tables, in Comunity of Madrid Transports Information System. The bus departs around every 20-30 minutes. The single ticket fare is 385 pesetas (2,31 Euros or around 2,1 US Dollars). Alternatively, you can use the Metro. The diagram of the lines is also available as a PDF file. At a minimum, you will need to exchange the line at Mar de Cristal station, to connect to any of the Suburban train stations. Very close to Colón, your will find the suburban train station of RECOLETOS; you will need to walk only 3 minutes. RECOLETOS station is located between Chamartín and Atocha. If you click over the map, a new window will open, with a larger scale. The suburban line C-8a will drive up to El Escorial. The journey will take around 60 minutes. You can check in the Comunity of Madrid Transports Information System, the time tables, but usually departures are every 30 minutes. The fare for a single ticket is between 400 and 500 pesetas (around 2,7 Euros or 2,5 US Dollars), depending on your starting point. If you've decided to move with Metro from the Airport, can reach El Escorial from any of the suburban train stations that match this line and metro stations (Atocha, Chamartín, Nuevos Ministerios, Pitis). A good option can be Chamartín, specially if you are traveling from anywhere by train. Other alternatives include several combinations between metro and bus or metro and suburban train. From the suburban train station at El Escorial, in a few minutes (with departures every 15 minutes), by bus (any line: 1 or 2), you will be at the door of the convention center (stop at Pza. Virgen de Gracia). Remember to indicate to the bus driver to stop you at the EuroForum Infantes building (San Lorenzo de El Escorial). The fare is only 130 pesetas (0,78 Euros or 0,72 US Dollars). Alternatively, you can use a taxi, direct from the Airport to San Lorenzo de El Escorial. This will take between 60 and 90 minutes, and the price will be about 9.000 pesetas (54 Euros or 52 US Dollars).